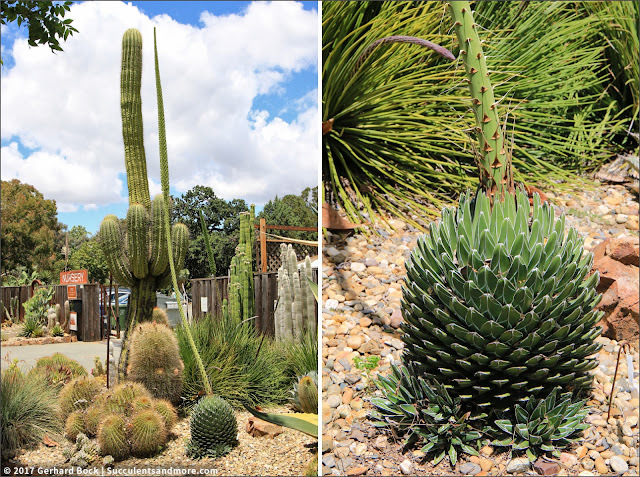 Ruth Bancroft, the humble Walnut Creek succulent lover whose vision would find recognition all over the world, will turn 109 this September. Big changes are in store for her eponymous garden, since 1994 a nonprofit affiliated with the Garden Conservancy. After decades of staff being cooped up in a trailer and visitors having to use portable toilets, ground will soon be broken for a multi-million dollar Visitor and Education Center that will offer office space as well as classroom and reception facilities--and real toilets. Preparations have already begun at the garden. 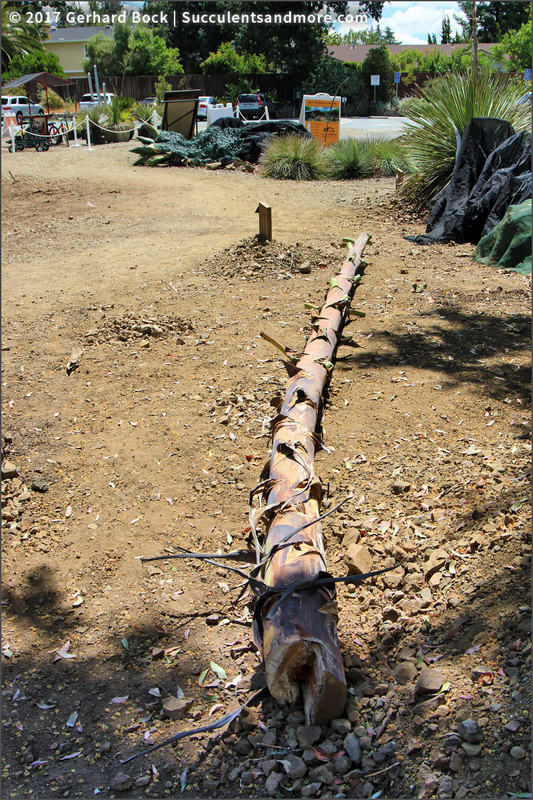 One of the Ruth Bancroft Garden's signature beds, planted with car-sized Agave franzosinii, is no more. Or rather, it has been radically reconfigured to make room for the new building and the adjacent patio. 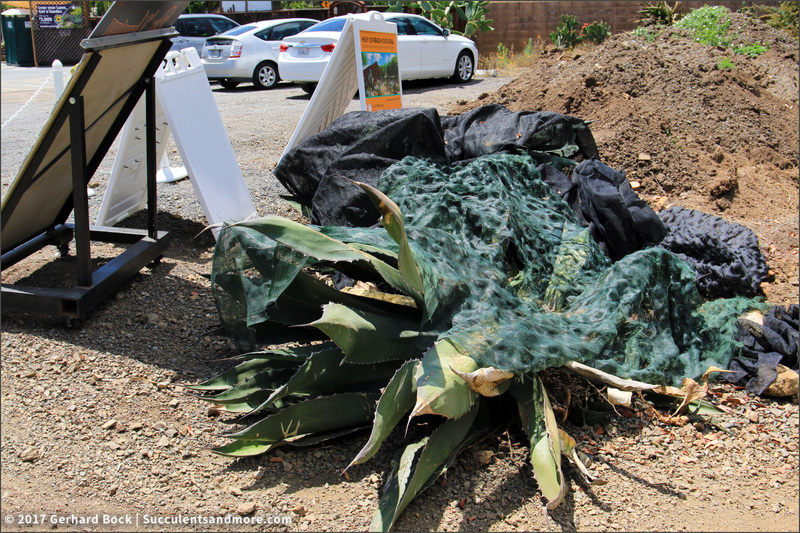 Most specimens of Agave franzosinii have been dug up. Some have been relocated, as you will see below, others are still waiting to be moved to their new homes. 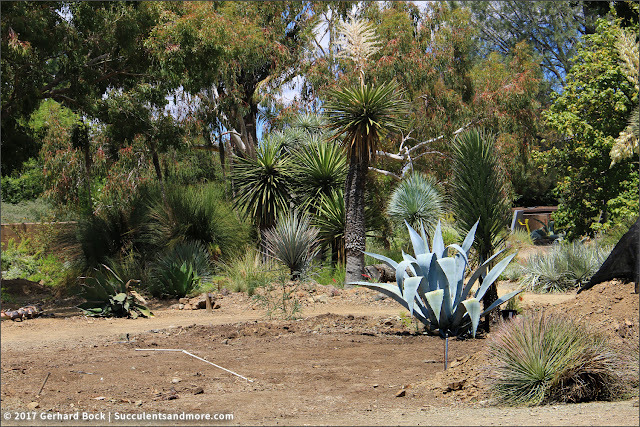 The other agaves that were part of this much loved bed, including Agave striata and Agave parryi var. truncata, are waiting for a new home as well. 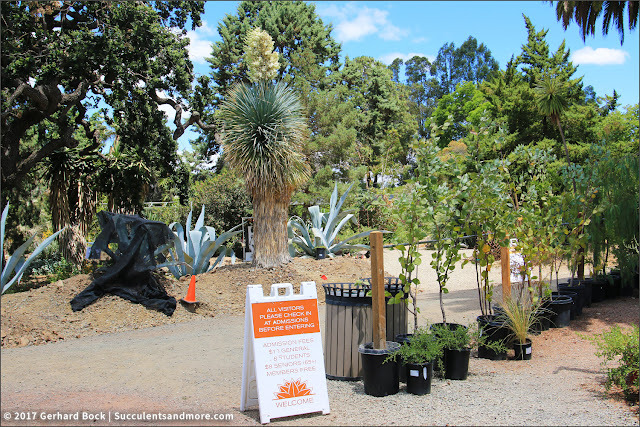 To complement the relocated Agave franzosinii, several mature specimens of Yucca rostrata have been added. 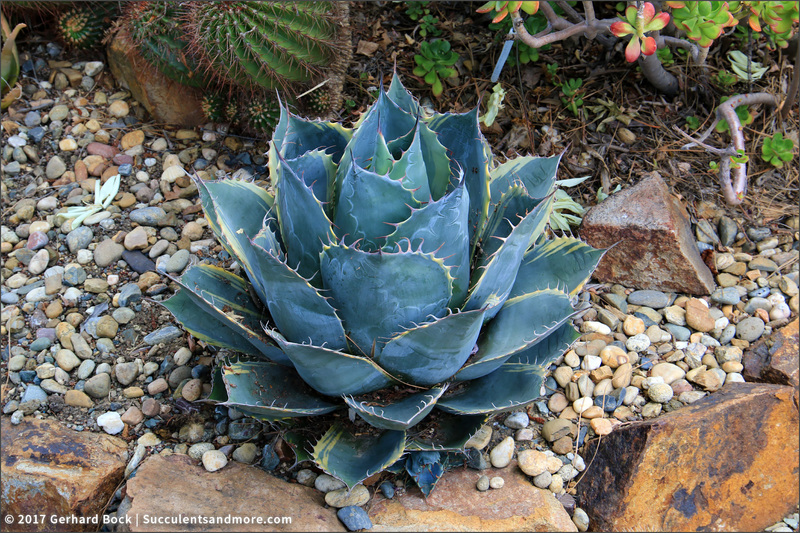 They make fantastic companions for the icy blue agaves. See the Agave franzosinii flower stalk in the next photo? My friend Brian Pyle, who volunteers at the RBG, pointed it out to me as we walked through the garden yesterday. Apparently the flower stalk will go to an avid surfer who will make a surfboard out of it. That's a new-to-me use for an agave. Talk about ethnobotany of the 21st century! 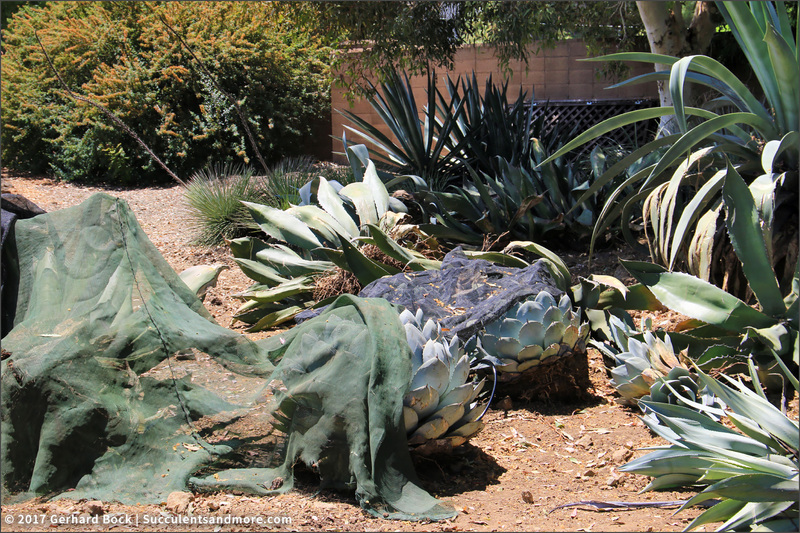 And I thought scrubbies made from agave fibers were cool. Here are some of the relocated Agave franzosinii. The new bed is in the same general vicinity in the old bed, but it starts several hundred feet further to the north. 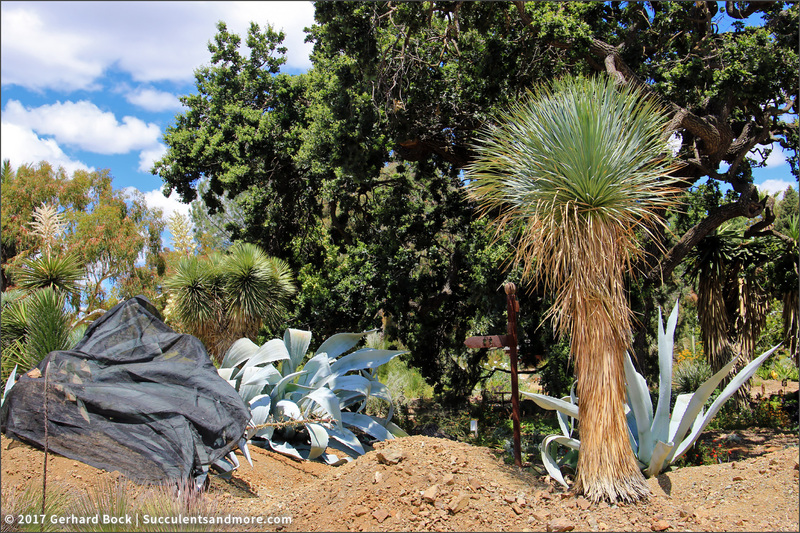 Here you can see some of the uprooted agaves. They're just lying there, waiting to be replanted elsewhere. The plants in full sun are covered with shade cloth. 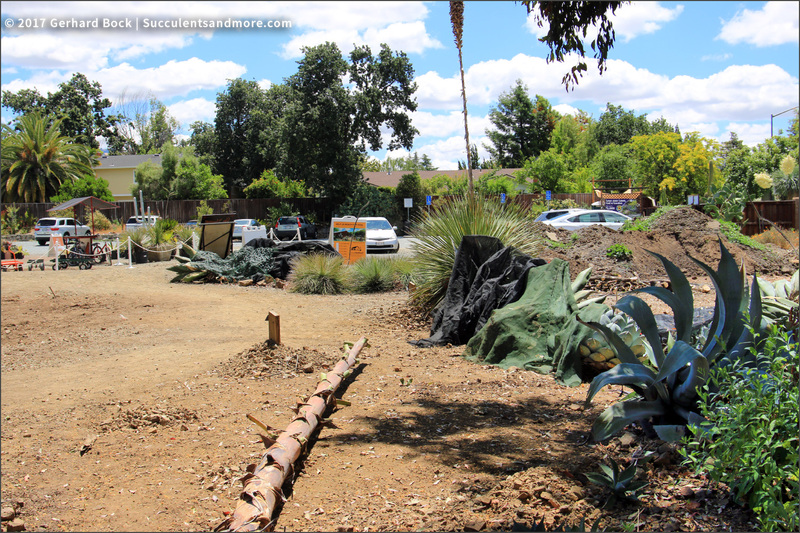 The exact timeline for this big construction project is still to be announced, but the nursery relocation will begin soon. 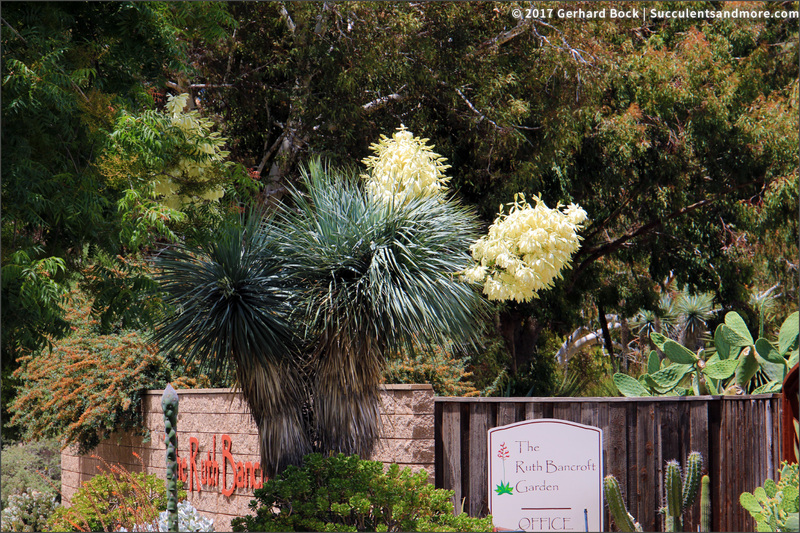 Most people who visit the garden probably admire the plantings along Bancroft Road as they enter. But after they park their cars, they forgot all about it and focus on what's inside the wall. 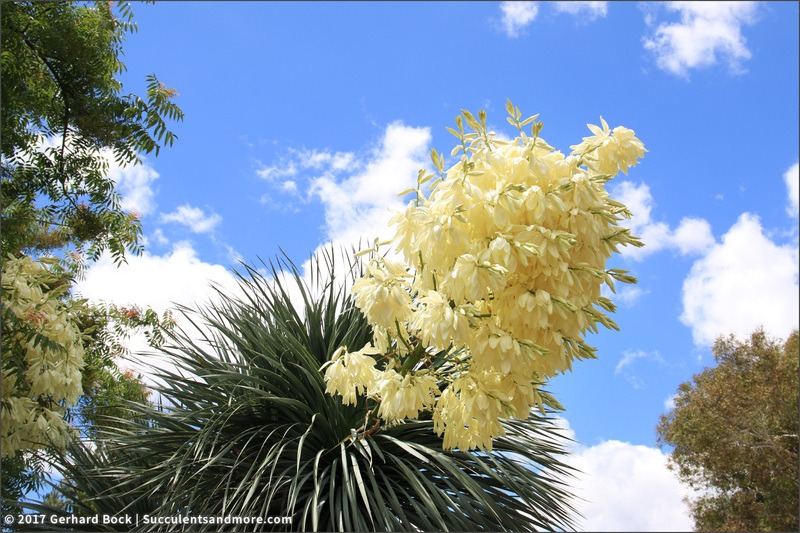 I usually make the same mistake (and it is a mistake), but this Yucca rostrata in full flower, clearly visible from the nursery, prompted me to check out what's going on outside the wall. I've kept it in a relatively small terracotta pot, which has dramatically stunted its growth. Seeing the mother (above), I know that I will never be able to let it loose in the ground. I simply don't have the room for such a giant. 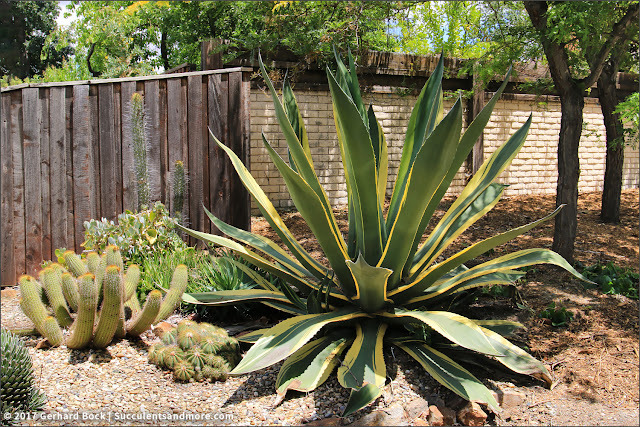 On the other end of the scale, this Agave parrasana 'Fireball' is much more manageable. I have a small pup and it has a long way to go before it will look this impressive, but I'm nothing if not patient--at least when it comes to plants. I took many more photos during my visit to the RBG yesterday. 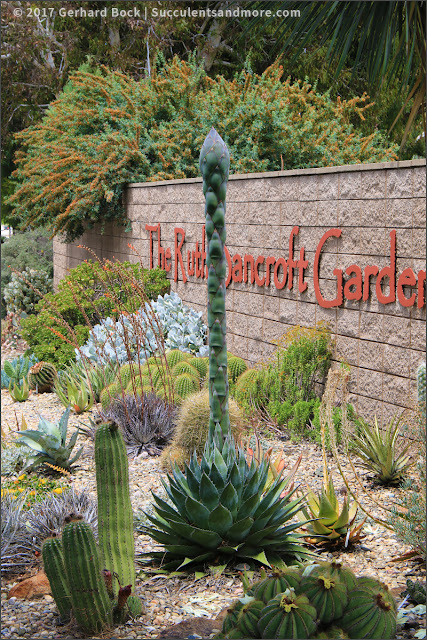 That's why I've decided to turn this week into Ruth Bancroft Garden week. On Wednesday, June 14, I'll have a post with 50+ plant photos, many of them showing vignettes that are new or that I've simply never noticed before. On Friday, June 16, I'll have a post about Sculpture in the Garden, the RBG's annual outdoor art show. Opening night for Sculpture in the Garden is this coming Saturday, June 17, 2017. Tickets are still available! Nice photos! 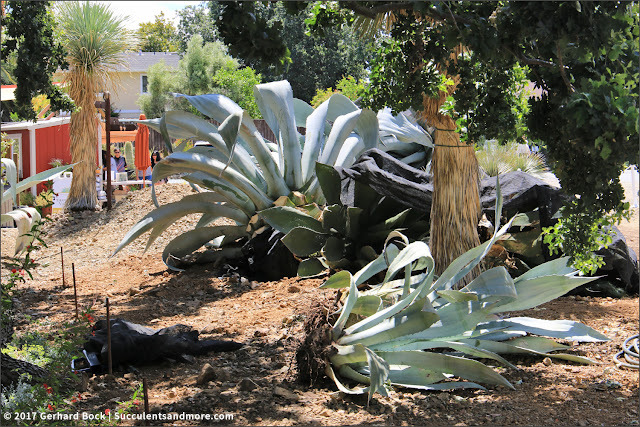 Hopefully we'll get to see the Agave surfboard when it's finished. Me too!! I think the garden should have one made as a special display for the Visitor Center! My gut response was to scream when I saw those A. franzosinii gone but then I took a deep breath and decided to trust the good judgement of the curators, Brian Kemble and Walker Young. I have to assume that this was not a decision that was made lightly. There probably was no other way to site the new building. I have yet to read the Bold Dry Garden but boy do I yearn to hold that copy right now!! The Bold Dry Garden is a great book. 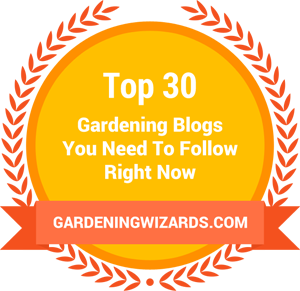 The story behind the garden is so fascinating. And the fact that Ruth has been able to watch her vision take off and soar makes it even more special. Like Loree, I'm a bit torn by this change. 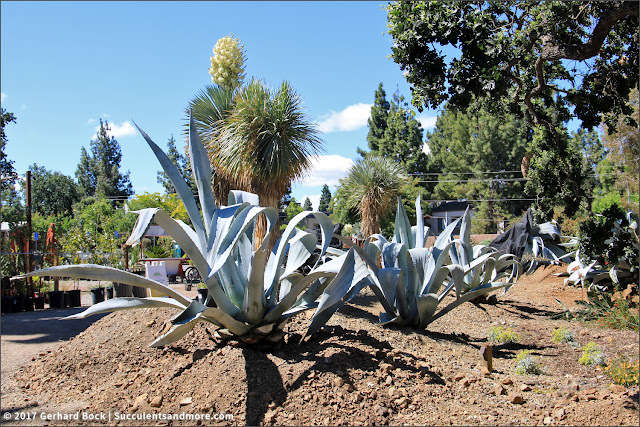 That bed was such a jaw-dropping bit of agave amazingness(new word.) Oh well, gardens, like life, are all about change and I'm sure they'll do great things with the new bed. I do recognize the inevitability (and value) of change, but some things are harder to get used to than others. This falls in the "harder" category! Yes, let's have a week of reading about the RBG. Thanks so much, Gerhard. I'm still wondering if I have the real franzosinii. Jeff Moore says the marginal teeth should be minimal and mine are rather pronounced. Any thoughts? I've read conflicting information about Agave franzosinii. Apparently the icy blue specimens at the RBG are the real deal. I've seen others (immature specimens, admittedly) that were deeper blue in color and had teeth more like Agave americana. They were labeled A. franzosinii as well. San Marcos Growers says that "[s]ome forms exhibit large teeth that are widely spaced while others have smaller teeth more closely spaced. Foliage color variations have also been noted from a startling white gray to a light gray blue." So yours may be A. franzosinii after all! I was a little concerned seeing the title of your post, but it's good news, not bad. 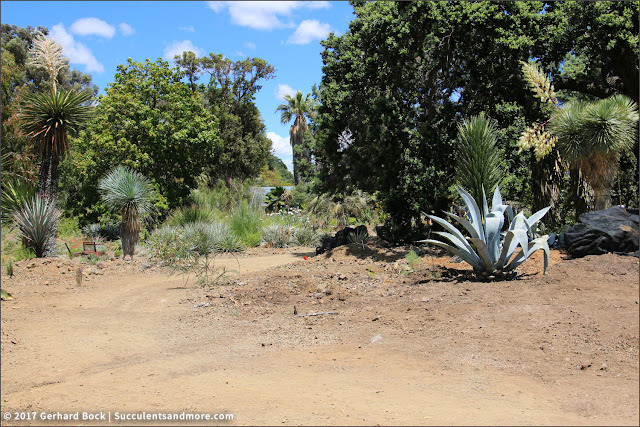 A facilities upgrade will bring more visitors and more activity, and that's the way to keep this gem of a garden alive. 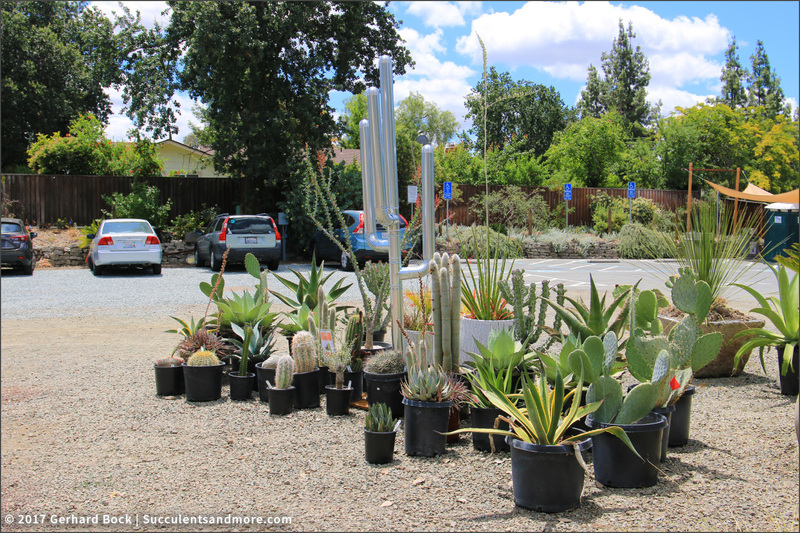 Oh, that plant nursery--it would be fun to go shopping there right now. We have happy memories of our visit, and I hope we get back there soon. I think the new building will be available for private events as well, like weddings, etc. That could be a good new revenue stream for the garden. 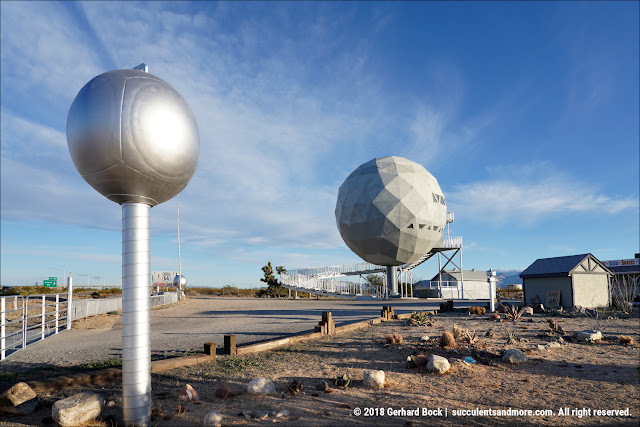 Beautiful photos (as always) Gerhard! So fun to see you there!